Upgrading the MacBook Pro Core Duo to 802.11n Wireless Connectivity. NOTE: This article was written many months before OS X 10.5/Leopard was released. OS X Leopard users do not need to buy the 802.11N Enabler and can ignore the notes on installing it using Pacifist as well as the Airport Extreme 2007-00x updates which applied to OS X Tiger (10.4.x) only. Although initial feedback was positive, some later reports in Nov/Dec. 2008 noted poor 802.11G/mixed mode performance (although 5GHz/N only mode was fine). See reports on the Mac 802.11N reports page under "Latest Feedback on Core Duo MacBook Pro upgraded w/Mac Pro N card". 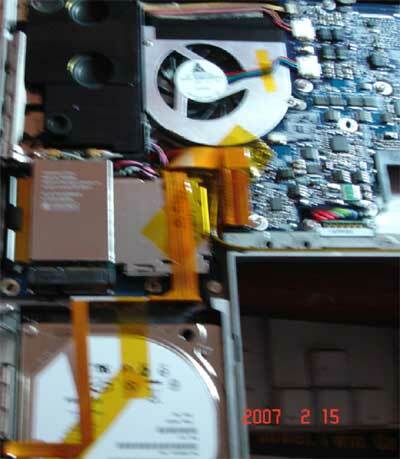 FYI: On Feb. 27th, 2007 I was told that a service bulletin was sent to Apple dealers/service providers saying that the Mac Pro Airport Extreme (N compatible) card kit was not (officially) supported in any other products than the Mac Pro and iMac late 2006 models (except 1.83GHz model) and "could cause damage" in other models and stressed to avoid any warranty exceptions, they should not install the card in other than those "supported" models. (There are probably thousands of Core Duo MacBook/MacBook Pro, Core Duo iMac and Mini owners that have installed the card in the last week or so - so far no "damage" reports.) 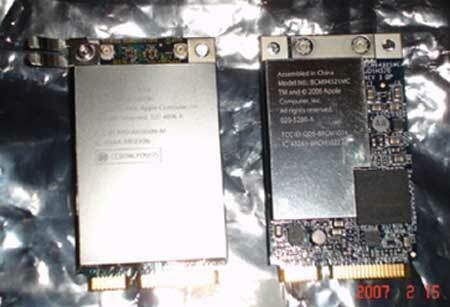 The Core2 Duo MacBook/MacBook Pros reportedly use an Atheros chip based card with 3 antenna connections (vs 2 in Core Duos) and I have not had anyone say they were able to buy that card so the Mac Pro kit card became the popular choice for those wanting to upgrade their Core Duo Macs. A Spudger (I did not find it necessary but you may). Always ground yourself by using an ESD wrist strap or by touching a metal object while handling sensitive electronics. Please follow the directions till you reach page six (6) of the online guide. After installation of the Mac Pro AirPort Card simply go backwards to reassemble the MacBook Pro Core Duo. NOTE: I would like to take this time to reference some information NOT listed in the online guide for MacBook Pro 17in Core Duo's. Please NOTE that the MEMORY COVER has 4 #00 Phillips Screws NOT 3. Also NOTE that the BATTERY COMPARTMENT has 3 #00 Phillips NOT 2. These are the major differences between the 17" and the 15.4" MacBook Pro Core Duo's. Disconnect the AirPort Antenna Leads from the onboard card. Then, with a Torx T6 remove the black retaining screw. This will allow the card to be removed. Please remember to ground yourself before touching the AirPort Card. Note the little sheet metal piece mounted on the upper left of the original card. I don't know what the purpose of this sheet metal is. (It appears to be a grounding/shield clip.) I decided to go a head and remove it and attach to the Mac Pro Card before installation. The piece can be removed from the backside of the card with a #00 Phillips Screw Driver. Here is the sheet metal piece attached to the Mac Pro Card (Upper Left) and ready to be mounted onto the MacBook Pro Core Duo Logic Board. Here is the card mounted, antenna leads in place with the black retaining screw also in place. Please note that over tightening the black retaining screw will result in the card "tipping" up on the left side and not allowing the upper case to seat correctly! Tighten the card in place to seat flush. Make sure to route antenna leads in a fashion to not interfere with the upper case. Everything should look as depicted above! Now, following the online guide, reassemble the MacBook Pro Core Duo and install the AirPort 802.11 Enabler (no longer reqd) to activate the AirPort Card. Please make sure all appropriate Software Updates have been installed (including any "Airport Extreme 2007-00x" updates) and Repair Permissions as Pacifist will NOT install the Apple AirPort Enabler if permissions are in need of repair! Obviously the Wireless channel and Current Wireless Network will vary as will Wireless Locale if outside of the United States. Type and Firmware should appear as listed. 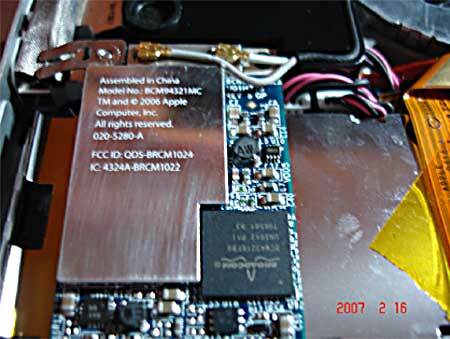 Model Wireless Network Adapter (802.11 a/b/g/n)!! Even without the AirPort Enabler installed you will see a dramatic increase in your wireless signal reception. I would estimate 150% for me. I have yet to receive my AirPort Extreme 802.11n Base Station so I cannot comment on 802.11n performance. As soon as I receive it I will make my information available here. I would like to thank Mike (xlr8yourmac) for his help in making this little project successful so far. He gave me information on the recent AirPort Extreme update 2007-001 which makes 2wire DSL Modems not visible with Intel Macs. 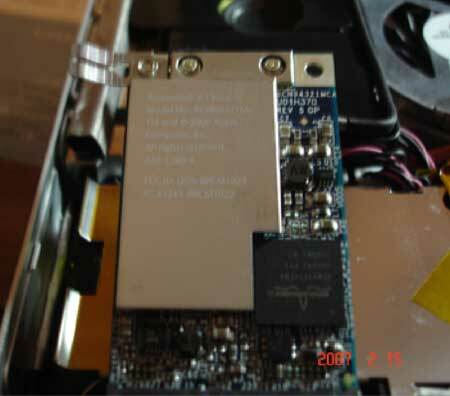 (He mentioned he was running WEP and the AE 2007-001 was reported to break WEP on 2wire.com products, which are often OEM supplier of modems/routers for cable and DSL. Later AE 2007-00x updates addressed that bug.) I had to reactive my AirPort Express' to make this work. For other Mac 802.11n reports/tests/tips, Apple Docs, Airport Extreme 802.11n and non-Apple 802.11n base user reports, see the Mac 802.11n page here. There's also a later page on Mac 802.11AC adapters.